The movement was launched to popularise the ideas of Naomi Klein's influential book on climate change, This Changes Everything. Klein pointed to the need for a mass social movement addressing the urgent need for climate action and an agenda for social justice. Rally participants represented a wide range of social movements. Featured speakers included three members of parliament (two New Democratic Party, one from the governing Liberal Party), union leaders (postal and public sector workers), environmental groups (such as Greenpeace and 350.org), and indigenous groups (such as Idle No More). 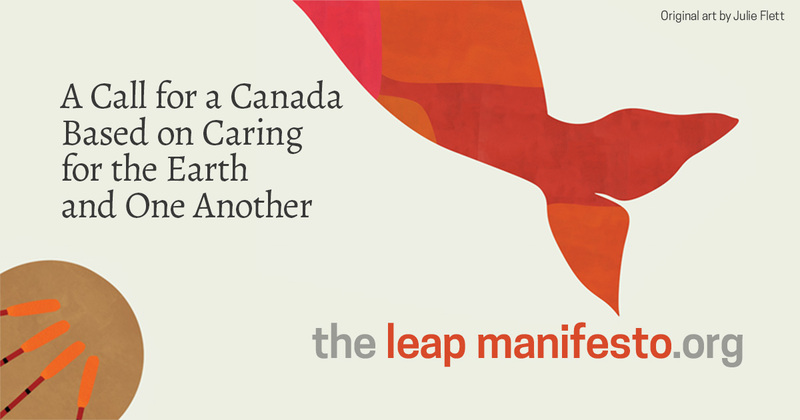 The Leap Manifesto, with more than 34,000 signatories, calls for varied measures toward the goal of a society “caring for one another and caring for the planet”. The list is headed by respect for indigenous people's “inherent rights and title” to the land; immediate action for a 100% clean economy by 2050; and a halt to “infrastructure projects that lock us into increased extraction decades into the future”. Other points highlight longstanding goals of the workers' movement, such as investment in public infrastructure, “an end to all trade deals that interfere with our attempts to rebuild local economies”, a national childcare program and expanded and affordable public transit. The Manifesto's diverse goals are interlocking and mutually supportive, its supporters say. Thus at the March 27 meeting, first speaker Bianca Mugyenyi described achieving the target of 100% renewable electricity generation in 20 years as “a healing process from colonisation”. Playing on the fact that this year is a leap year, Mugyenyi said that to combat climate change, “Small steps are no longer enough. 2016 is our year to leap”. Mugyenyi stressed the need to hold Canada's Liberal government, headed by Prime Minister Justin Trudeau, to the sweeping promises made when it was elected to act on climate change. “They are not connecting with our sense of the urgency of the moment,” she said. For example, the Liberals have promised C$3.4 billion over three years for mass public transit, “which won't even meet the outstanding transit repair budget in Toronto alone”. Mugyenyi noted that the Leap Manifesto has sparked interest in the social democratic New Democratic Party. More than 20 NDP local constituency groups have called on the party to adopt the Manifesto. Megan Whitfield, president of Toronto's postal workers, presented a program worked out together by her national union and Leap. It would convert the threatened Canadian postal service's unequalled network of 6800 retail outlets into centres of community service and community action on climate issues, for example through introducing postal banking. When the government acts on its decision to cease sending cheques through the mail, she said, “this will provide a way to receive pension payments for all those who can't get an account in a conventional bank”. Leap's March 29 meeting in Toronto was the most effective held here on climate justice issues in several years. It embraced an impressive range of activist forces that could lend support to the Leap/postal worker program and similar projects. Inevitably, a text aimed at encompassing such diverse viewpoints must be more limited in scope than the bold measures presented in Klein's This Changes Everything. But to focus on the manifesto's omissions would miss the point. The manifesto has proved its capacity to unite a broad range of social forces and to pose the challenge of climate justice within the mainstream organisations of Canadian working people. It is an eloquent contribution to the debate the Trudeau government is initiating on a national climate action plan. Moreover, public attitudes in Canada to climate-related issues are radicalising, encouraging us to elaborate key issues that the Leap Manifesto touches on only briefly. Prime examples of such projects are the oil industry's unpopular projects to build pipelines across the country. Pipeline opponents include the Chippewas of the Thames First Nation. They are taking their legal suit against Line 9, which runs from Sarnia to Montreal, to the Supreme Court. At the Toronto rally, climate activist Jesse McClaren appealed for donations to meet their legal costs. Lewis called for an end to subsidies for the fossil fuels industry and highlighted a new Alberta-based website, “Iron and Earth”, established by tar sands workers committed “to incorporating more renewable energy projects into our work scope”. “The workers should be supported, not the corporations,” Lewis said. The rally shows that the Leap Manifesto has become an effective organising tool that deserves support from all sectors of Canada's climate justice movement. The pending debate on national climate policy should enable us to greatly expand support for the Manifesto and its goals. The Truth and Reconciliation Commission has acknowledged shocking details about the violence of Canada's near past. Deepening poverty and inequality are a scar on the country's present. And Canada's record on climate change is a crime against humanity's future. We could live in a country powered entirely by renewable energy, woven together by accessible public transit, in which the jobs and opportunities of this transition are designed to systematically eliminate racial and gender inequality. Caring for one another and caring for the planet could be the economy's fastest growing sectors. Many more people could have higher wage jobs with fewer work hours, leaving us ample time to enjoy our loved ones and flourish in our communities. There is no longer an excuse for building new infrastructure projects that lock us into increased extraction decades into the future. The new iron law of energy development must be: if you wouldn't want it in your backyard, then it doesn't belong in anyone's backyard. That applies equally to oil and gas pipelines; fracking in New Brunswick, Quebec and British Columbia; increased tanker traffic off our coasts; and to Canadian-owned mining projects the world over. Power generated this way will not merely light our homes but redistribute wealth, deepen our democracy, strengthen our economy and start to heal the wounds that date back to this country's founding. We call for an end to all trade deals that interfere with our attempts to rebuild local economies, regulate corporations and stop damaging extractive projects. Rebalancing the scales of justice, we should ensure immigration status and full protection for all workers. Recognizing Canada's contributions to military conflicts and climate change — primary drivers of the global refugee crisis — we must welcome refugees and migrants seeking safety and a better life. Shifting to an economy in balance with the earth's limits also means expanding the sectors of our economy that are already low carbon: caregiving, teaching, social work, the arts and public-interest media. Following on Quebec's lead, a national childcare program is long past due. All this work, much of it performed by women, is the glue that builds humane, resilient communities – and we will need our communities to be as strong as possible in the face of the rocky future we have already locked in. Since so much of the labour of caretaking – whether of people or the planet – is currently unpaid, we call for a vigorous debate about the introduction of a universal basic annual income. Pioneered in Manitoba in the 1970's, this sturdy safety net could help ensure that no one is forced to take work that threatens their children's tomorrow, just to feed those children today.